Well met! and Welcome to Imperia! Imperia is an in-depth Structured HFFFRPG (Structured High Fantasy Free Form Role Playing Game) that has been in existence for over a decade and a half, founded originally in 1996. Imperia has slowly and steadily grown over the years, attracting only the most creative of players. The setting itself has been made over a decade and a half and is constantly updated, either by the Game Master or by other users. 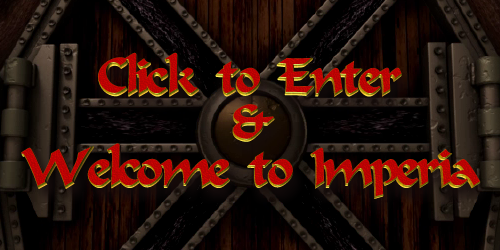 Imperia welcome’s any creatively inclined players to try out and create a character. We do have high standards here, but the reward for such high standards, is a cornucopia of fresh and highly motivated players. All of which have a shared interest in the furthering of every one of their characters. And no we do not limit you to just one character, you are free to be as creative as you like with character creations. For those who are here for information, you've come to the right place. We here at Imperia have a burning desire for role play, we strive for excellence and greatness in all of our players. The type of role play you'll find here is unlike any other channel on IRC. No other channel has the wealth of knowledge and role play experience that we have come to think of as commonplace; some players are still around, even 15 years later from when we first started. Each and every player in Imperia has passed our standards of quality in character creation. As we hold everyone here to the same standards, regardless if they are brand new players, or veterans. Also here at Imperia, we encourage all of you who end up joining, to take an active role in the game's setting. Not just through role play and character creation, but also through setting creation and suggestions. We don't look down on creativity here, we welcome it and hope that with any idea's you may have, you'll present them to an OP or the Game Master. As for the medium of game play, we are primarily located on the SorceryNet IRC Server channel #Imperia which is our OOC(Out of Character) channel. However we do have a forum which we whole-heartedly encourage you to use, it can be found here. Posting can be done either in Live chat, or on the Forum, either is accepted. To date most users are using the IRC Chat, but we all make use of the Forum, as you will find much information there that is pertinent to the setting, and all character creation is done through the forum. You’ll also find role play logs from the IRC chat if the events that happened during role play were important enough to document. The forums are also used for creating news bulletins for In Character news broadcasts over the manacasters. So you’ll find some very useful information on our forums, so once again, welcome to Imperia, and we hope you stay a while and become an active and contributing player in our setting. To begin, just click the image below and enter the site.